The American dream set in Paris. 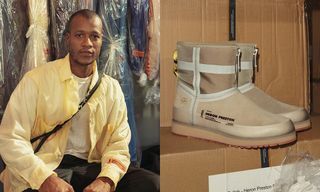 New York and Milan-based designer Heron Preston is experiencing exactly that. 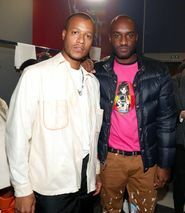 It was only six years ago that Preston, together with ALYX 1017 9SM founder Matthew Williams and street-luxe king du jour Virgil Abloh, formed hype brand Been Trill, the art collective and DJ crew turned Tumblr-inspired streetwear line. 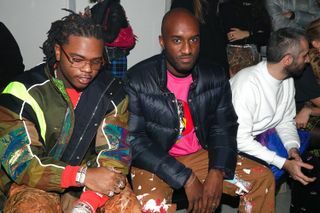 Today, the three are among the most exciting and loudest names on the Paris menswear schedule, pioneering luxury for a younger crowd who don’t always feel connected with traditional luxury brands. 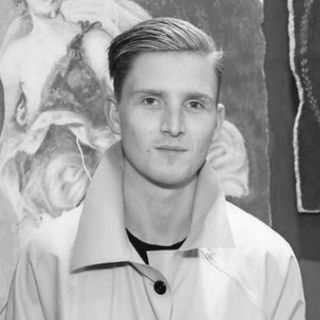 Where many heritage European luxury houses remain in their ivory tower looking down, designers like Preston are in the field with their consumers. It’s how they stay informed and ahead. 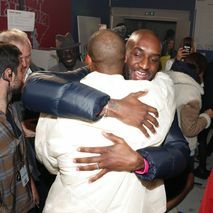 For his namesake label’s debut Paris runway show, presented at the Palais de Tokyo, Preston didn’t disappoint. Titled “Nightshift,” the collection played into Preston’s frequent travels around the world, as well as his fascination with TSA agents and security guards. There were X-Ray baggage scanners, metal detectors, and projections of toy grenades, dogs, and security footage of the showgoers themselves. K9 dogs were accompanied by heavily loaded guards at the space’s entrance. All were part of an act — unknowingly to much of the audience. “I like to blur the line between reality and [fantasy],” Preston told us. While the show’s dystopian airport terminal setting was a cooked-up fantasy, the clothing was where the “reality” Preston talked about came into place. It felt like uniform-dressing, in the way that the designer’s young, growing clientele would wear the items in their actual day-to-day lives. No crazy antics there. 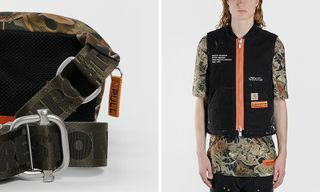 There were utility vests, flaming skull T-shirts, sporty cycling shorts with contrast stitching, and colorful anoraks made from upcycled military-grade parachute nylon. The knitwear was new, so was a collab with Nike on the sportswear giant’s Huarache sneaker. There was also more emphasis on sustainable production and fabrics, as seen in the cotton, fleece, and jersey pieces made using organic materials. It was also the first season in which Preston introduced a full women’s collection, including the Cube bag — a new accessory with clean lines and a quilted exterior. Not everything was new, however. There was plenty of familiarity in the collection as well. Much of the line was finished with orange detailing — one of the designer’s signatures — as well as his hallmark Cyrillic “STYLE” logo, which originated in a collaboration with Nick Knight’s SHOWstudio platform five years ago. Preston’s partnership with UGG was renewed for a second time, too. For FW19, it came in the form of two boots: a traditional slip-on with a zip front and leather pull, and a low-cut slip-on with an interior sock. Both came in beige and orange colorways. 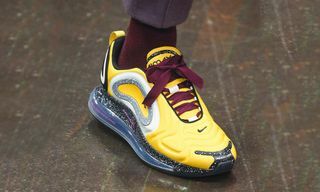 Whereas in the past few days at Milan Fashion Week Men’s, we’ve seen luxe brands such as Prada and Fendi shying away from streetwear codes, Preston stayed true to his streetwear roots, and it worked. 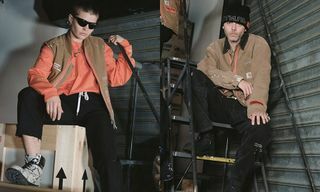 For more from Heron Preston, be sure to check out his recent workwear collab with Carhartt WIP.